Available here. Seems to be quite significant. Interesting re the debt levels of clubs 11 senior and 1 junior club owe in excess of €500k and 3 of those clubs seem to owe €4.3 million between them. I do find it ironic that it is the clubs in the most debt that are the ones calling for the changes. Economic change are happening in all clubs due to economic conditions and not because of IRFU policy. I wonder whether the IRFU believes that the value of "integrity" should apply to citation commissioners. Longtime Turnipfans.com poster who retired when the Munster Girl Guides Association started Moderating. Frankly under 21 as an age grade is ridiculous. Guys are 3 and sometimes 4 years in this age grade before they hit Senior or Junior Rugby. Should be under 20 and then move them on. The situation with Under 21's in Lansdowne, UCD and to a lesser extent Trinity is really hurting participation levels. Frankly, any club cannot reasonably facilitate more that 55 (60 at a push) players in their U21 program, let alone 200. Its simply not practical. Branches need to find a way to funnel those that will not get games into other clubs where possible. Darce wrote: Frankly under 21 as an age grade is ridiculous. Guys are 3 and sometimes 4 years in this age grade before they hit Senior or Junior Rugby. It's been like that for over 15 years. UCD had 200 or so in 1997. Decent players were getting a half every two or three games, if they were lucky. Guys from small schools never had a chance. Over half were gone by Christmas. It was a funded sports club so they could charge members a token amount £2 or £5, add in training on campus and clubs didn't get a look in unless they'd already (mostly) recruited them. Elite 20s programs aren't doing anything for numbers, they're pushing others out. 21s is not ridiculous. With schools as 19s the next age group should never be 20s and the schools will never change from 19s as they will lose a considerable number of potential players able to compete for the must win cups. Yes ways of getting players into other clubs to play junior rugby if 21s not available is the answer but how to do that? Directly eliminating payments to players when there's already a cap of €64k/year wouldn't appear to address the major issues. It adds up over years, but there are still too many ways for clubs to get themselves into trouble. Some of the arrangements with respect to transferring players will fall heavily on guys who aren't getting on and just want to play. It's an interesting idea to discuss the elimination of scholorships, probably required in the context of everything else, but tricky nonetheless. Also the idea of removing all semi-pros and having only provincially located players puts a major premium on any of such players who'll be available to play. Bannings financial inducements for recruiting schools players doesn't stop clubs from spending money to recruit schools players, it just changes the focus to the resources made available for the new players and doesn't address the issue in the report of clubs sometimes only being interested in the best schools players. I'm sorry but what role do schools have to play in keeping guys who are 19/20, not getting a look in at U21's, in the game of rugby? Or do you mean they should encourage them to look beyond Lansdowne/UCD/Trinity? IMO, The club age grades should mirror international and provincial grades. I don't see the point in lads playing an extra year of age grade rugby, particularly when there is no representative age grade honours available to them. They should be moving to Senior Rugby where they are good enough or they should be filling from J1 down based on ability. Constant chopping and changing of eligibility dates has starved Junior teams of fresh recruits as it were. My point relates to guys who are getting no gametime at all while caught up in a system that isn't working. Take UCD as an example. Their team in J2/J3 this season was very weak and very in consistent. I'd be bet guys are not being encouraged enough to play down for gametime. Outside of J1, Trinity is much the same. As a former player of UCD we have massive issues trying to keep people in the club to play J2 and J4. A lot of guys see the club as good for u21's and when they graduate (either from the college or move up an age group) move on to another club. Hell we have problems keeping them to play for the firsts and J1 some years. We can't force them to tog out for us (much as we might like to) and so we have a situation where despite fielding up to 4 u21's teams some weekends we struggle to get 15 out to a J2 game. There's serious talk of disbanding the J2 team after this year the numbers were so bad. tate wrote: As a former player of UCD we have massive issues trying to keep people in the club to play J2 and J4. A lot of guys see the club as good for u21's and when they graduate (either from the college or move up an age group) move on to another club. Hell we have problems keeping them to play for the firsts and J1 some years. So apparently u21s is reverting to u20s next year. tate wrote: So apparently u21s is reverting to u20s next year. 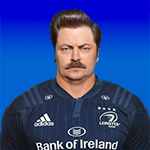 Leinster are moving age back 6 months to July 1st . Munster I Believe will remain at January as will IRFU For All Ireland competitions all very confusing and the branch me thinks have messed up! U21s players follow the money/"scholarship" trail. When only a couple of clubs offer this there is a imbalance in ability levels at each club as the clubs that can offer these enticements only want the best players( just look at Irish U20s squad, 13 players from Leinster, 12 of which come from 2 clubs! ).So all the other clubs pick up the unwanted and the league becomes a two tiered farce. If these clubs wish to act professional then they should act fully professional and pay compensation to each players original club, with this amount increasing if the player has played representative. This would either curb the couple of clubs recruiting all the representative players or spread the wealth. I agree with much of what is contained within the sustainability report, particularly with regards to 21s/20s but I have an even bigger problem with the points scholarships offered by universities. To have 50 points chopped off what's expected for a course because you can play rugby is disgusting. We are only a short distance away from lowering the expectations required of these players to earn their tertiary qualification. Only saw this now but its a problem of the system of 13-18 year olds in some areas of the country having little or no involvement with a club in their teens and then by the time they are finished school they don't have an immediate pathway like there is with youths rugby who have the u20s/21s or adult junior/senior sides.